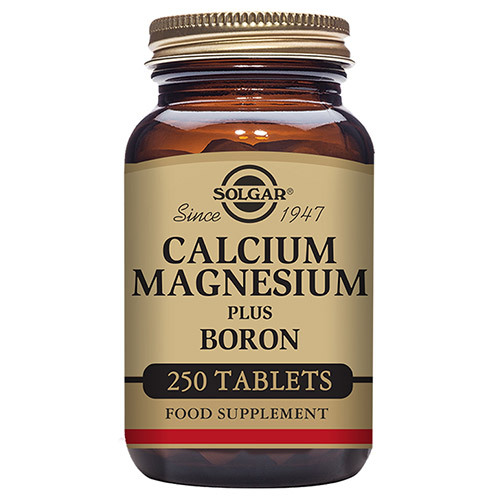 Solgar® Calcium Magnesium Plus Boron contains key nutrients Calcium, Magnesium and Boron. Calcium is the mineral which is most present in our body and is stored mainly in our bones. It is required for strong and healthy bones, and teeth. When we age the absorption of calcium decreases, reason that we should make sure we have enough calcium in our diet by eating dairy products such as milk, yogurt, cheese and butter. Intake of adequate calcium amounts as part of a healthy diet, along with physical activity, may reduce the risk of health concerns connected with bones and joints in later life. When we are not able to reach adequate levels of calcium through our diet, a supplement might be advised. Magnesium is considered by experts to be a vital mineral required by every organ within the body and can naturally be found in leafy green vegetables. It can be recommended for everything from promoting restfulness, supporting muscle function, to releasing energy from food and so relieving tiredness, as well as aiding towards a balanced mind. Boron is an important mineral which can be found in whole foods as beans, nuts, grains and avocados, as well as in fruits like berries, oranges and grapes. Traces of boron can also be found in our drinking water. 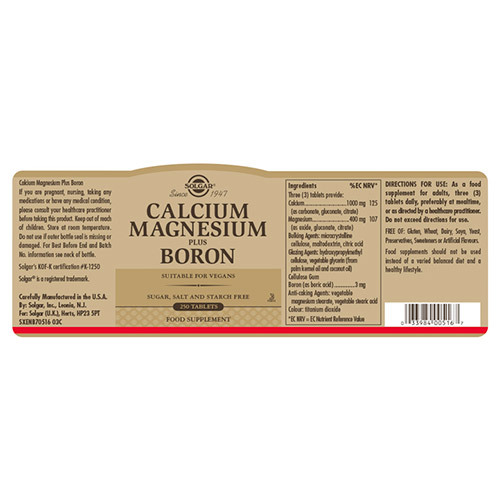 Boron supplements are advised especially for those on a restricted diet such as vegans. 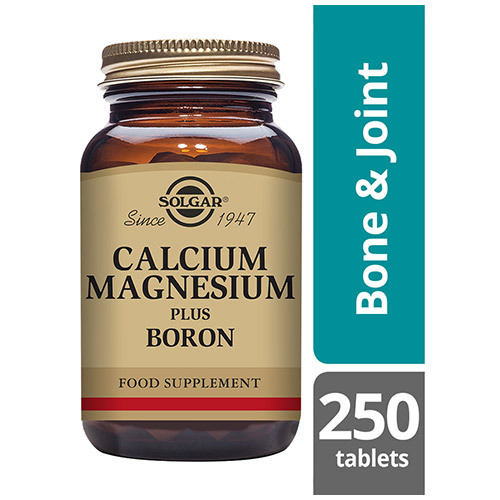 Solgar® Calcium Magnesium Plus Boron delivers magnesium, calcium and boron with 3 tablets daily, supporting your optimal wellbeing. 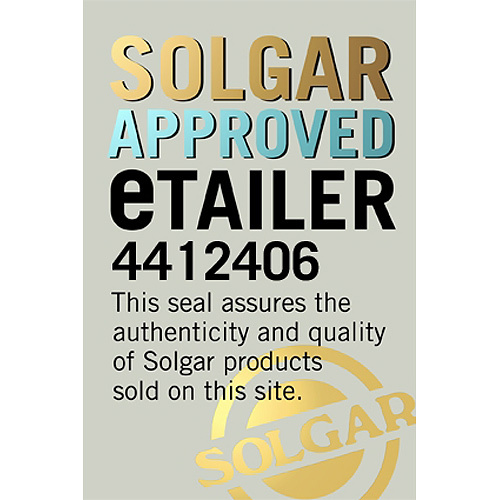 Also contains: Bulking agent: microcrystalline cellulose, Anti-caking agents: vegetable stearic acid**, vegetable magnesium stearate**, Glazing Agent: hydroxpropyllmethyl cellulose, Citric Acid, Cellulose Gum, Colour: titanium dioxide, Vegetable Glycerin. Calcium (as carbonate, gluconate, citrate), Magnesium (as oxide, gluconate, citrate), Bulking Agents: microcrystalline cellulose, citric acid; Glazing Agents: hydroxypropylmethyl cellulose, vegetable glycerin (from palm kernel oil and coconut oil); Cellulose Gum, Boron (as citric acid, boric acid), Anti-caking Agents: vegetable magnesium stearate, vegetable stearic acid; Colour: titanium dioxide. As a food supplement for adults take three tablets daily, preferably at meal times, or as directed by a healthcare practitioner. Do not exceed directions for use. 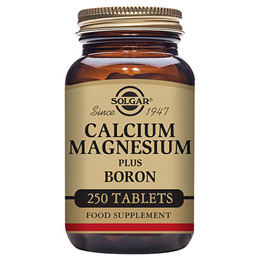 Below are reviews of Solgar Calcium Magnesium plus Boron - 250 Tablets by bodykind customers. If you have tried this product we'd love to hear what you think so please leave a review.